This is attempt number 231 at blogging. OK, mild exaggeration, it's attempt three but I digress. I am incredibly good at Instagram however, so be sure to follow me there @forknswoon or click the icon links to the left, or at the bottom of this post. Happy Lunar New Year! I'm late, I know, it's a celebration that lasts about a month, from mid-January to mid-February and I still managed to be late. Typical. I usually try to make a dish for holidays because it makes me feel festive and it gives me an excuse to research what the holiday is about, what foods are eaten and why. Many of the countries that celebrate are very superstitious so there are many lucky foods to eat on Lunar New Years Eve. Long noodles, the longer the better, are to bring long life, wontons and dumplings are to bring wealth, because they sort of look like ingots (depending on how you fold them) which were once used a currency, and whole fish to bring abundance in the coming year. See, lots of fun facts I wouldn't have discovered if I weren't really hungry and wanted to eat Chinese food. I bought dumpling wrappers ages ago from H Mart, where I often find myself wandering around aimlessly looking for inspiration as well as spending a bunch of money on things I inevitably put in the freezer until a later date. These pork and shrimp dumplings are the traditional filling for Honk Kong style wonton soup, equal parts pork and shrimp. For the fried dumplings I added a bit of garlic, which the soup dumplings didn't call for because things with garlic in them are delicious and I figured I couldn't go wrong. Folding the dumpling wrappers was easy after watching a few videos on YouTube like this, this and this. I ruined at least six of the first dumplings I sealed shut but each one was a little better than the last and by seven I had figured it out and added a bit of my own trick. I immediately fried up and ate the "ruined" dumplings so there was no proof of their existence before photographs could be obtained or I could be blackmailed with the evidence. I find myself craving dumplings all the time. Sometimes it's just for the dumpling itself, the doughy wrapping, sometimes steamed and chewy or fried and crunchy both giving way to juicy insides which are a flood of flavor. Other times I think I crave them because they're the perfect vessel for that amazing ginger soy dipping sauce that I could probably drink if no one was watching. I like to bite the corner of the wrapper and then flood the inside with sauce so that my next two bites are salty goodness. Yes, double dipping, shame on me, but the secret it DON'T SHARE and then you can dip as many times as you'd like. I kept overestimating how much the dumpling wrappers would hold, so start small and work your way up. I think the fold you use definitely affects how much you can squeeze in there, so choose wisely. Hopefully now you're hungry and prepared to try these out on your own. Lots of luck to you in the new year! Toss all filling ingredients in a large bowl and mix well. Let rest for 30 minutes up to 2 hours so the flavors can blend. With a teaspoon scoop into the very center of your round dumpling wrapper and fold according to your choice. Set aside on a parchment covered cookie sheet and cover with a damp towel so the wrappings do not dry. Here you can put the dumplings in the freezer so you can cook at a later time or cook immediately. Cover a non-stick pan with a bout 1 tbsp of peanut, corn or canola oil over high heat and carefully add your dumplings to the pan and cook for 2 minutes. After two minutes, add 1/4 cup of water to the hot pan and immediately cover with a lid to steam for 4 minutes or until the water has nearly all evaporated. Remove the lid and cook for an additional 2 minutes and serve along side your dipping sauce. 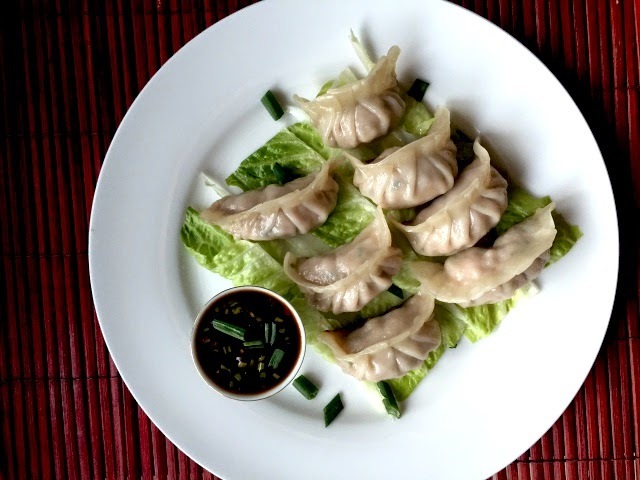 If cooking your dumplings from frozen, add additional water before you steam and adjust time accordingly, about 3 additional minutes to cook.